Today the Lakewood Police Department, along with state and local city officials, unveiled and dedicated a memorial in honor of four Lakewood Police Officers killed in the line of duty one year ago today. 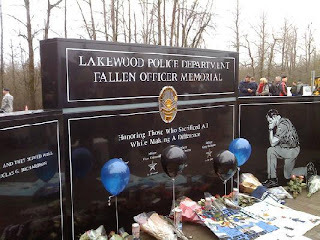 The memorial bears the names of Sgt. Mark Renniger and Officers Tina Griswold, Ronnie Owens and Greg Richards etched above four stars with the date they were killed inside a Forza Coffee Shop located in Parkland/Pierce County. Tina Griswold was actually my neighborhood precinct Officer - she was a wonderful and dedicated Officer who is surely missed. Remember to thank those in Uniform (our first responders and military) and pray for them & their families daily! Thanks to Mrs. Shohomish County, Jessica Riggs, I had the opportunity to participate in a photo shoot with Jessica promoting Precor fitness equipment. Thank you again Jessica for inviting me to be a part of this fun event! One of the models, Nasca, getting pampered by our hair and makeup artists. They did such a great job with all of us! In the break room during lunch with my new friends. Getting ready for our next photo shoot - we got quite the workout! From left to right: Marc, Taylor, Nasca, Brandon, myself, Tamara and Megan. What a fabulous group to work with! I met some of the nicest people! Megan, myself and Nasca modeling Gold's Gym T-shirts in honor of Woodenville's Gold's Gym hosting the Precor photo shoot! Operation Homefront has partnered nationally with Dollar Tree, Inc. and will solicit and encourage patrons of the Dollar Tree and Deal$ stores to purchase and donate a toy to be placed in the collection box at their store. Over 4,000 Dollar Tree and Deal$ stores around the country will be collecting toys from November 1st through December 6th 2010. Toys will be distributed to the children of our service members during holiday celebrations and events at various military installations and armories throughout the United States. This my fourth year working with Operation Homefront as a pick up and delivery volunteer. Each Christmas season I pick up, sort and deliver approximately 5,000 toys to military children at Joint Base Fort Lewis/McChord. 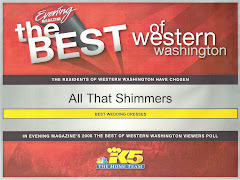 The store I service is the Lakewood/Steilacoom Dollar Tree. I am pictured above with my little Elves (my nieces Lauren and Hannah) and Dollar Tree Staff. I just love this store - they do a fabulous job every year! 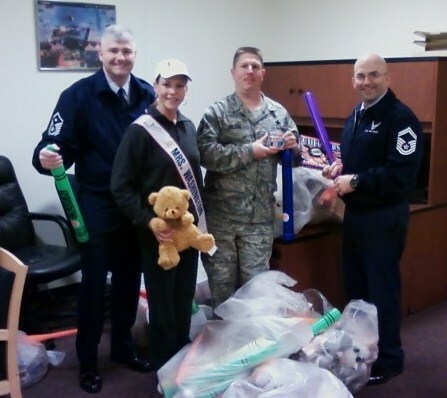 Delivering toys to Joint Base Fort Lewis/McChord. I am pictured above with MSgt. William Baker (First Sergeant), MSgt. Johnny Wilson and SMSgt. James Weber. God bless our men andd women in uniform! These toys will now be distributed to military children on base via Santa himself! Mrs. Washington 1999, Chung Himple, hosted this month's workshop. She did a fabulous job coaching the girls on their interview skills! From left to right: Mrs. Pacific Northwest (Lisa Bluhm), Mrs. Twin Cities (Ricolena Anders), Mrs. Thurston County (Dionne Tarter), myself, Mrs. King County (Derozette Banks) and Mrs. Washington 1999 (Chung Himple). Each of the girls got to be put in the "hot" seat to practice interviews. Above, Chung is giving feedback on things to be aware of during the interview process. Mrs. Hawaii, Alicia Jones, visited Washington State the first week of November. We had such a nice visit! Making a new friend in Alicia at Mrs. America definitely has been wonderful blessing. She brought me chocolate covered Macadamia nuts straight from the Islands of Hawaii along with spoiling me with some new Arbonne Beauty Products - LOVE HER! Thank you Alicia! Alicia and I went to the Ram on the waterfront in Tacoma. My best friend from elementary school, Raeanne Blakely was our server for the evening - what a fun night catching up with her as well! 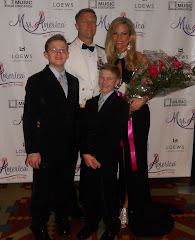 As promised, here are more pictures from "Queens for a Cure" Benefit Pageant! 2010 Queens for a Cure Participants! 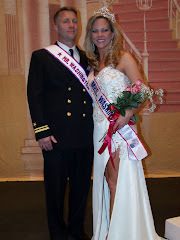 Saturday, Oct. 30 I had the honor to be a judge for the "Queens for a Cure" Benefit Pageant. Over $14,ooo was raised to help find a cure for Breast Cancer. The money raised will be donated to the "Susan G. Komen for the Cure" non-profit organization. Below I have posted a few pictures from the event. I am not able to upload any more pictures as my cable service is having technical difficulties. I will be sure and post more pictures of this event after this issue is resolved. Ms. Classic American Renaissance - Linda Elledge, Laura Hunter - 2010 Ms. Queen, myself and 2009 Supreme Princess - Isabelle Banks. With with my dear friend Rosemary Mann and her daughter Taylor Mann (2009 Supreme Queen). Taylor also was awarded Queen of Queens for raising over $2,000 for breast cancer research. Congratulations Taylor! The Director of Queens for a Cure Benefit Pageant - Nicole Miller. She did a fabulous job in putting together a very successful and professional program. Over 80 ladies of all ages participated in the event. She also did a fantastic job in keeping things organized and simple for the judges - very impressed! Way to go Nicole!